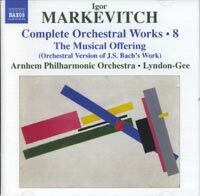 IGOR MARKEVITCH (1912-1983): Complete Orchestral Works, Vol. 8 - J.S. Bach: The Musical Offering. Description: Written for the 1950 Strasbourg Bach Festival, Markevitch presents Bach's collection of pieces in the form: Ricercar à 3; "Theme with Variations" in which he reordered the various canons (and wrote an inversion of one) to create an ascending curve of tempo; the Sonata (with a canon interpolated); and the Fuga à 6, dispersing three orchestral groupings antiphonally across the stage, strings on left and right and the instruments that play the Sonata (with continuo group and four solo instruments) in the center. Arnhem Philharmonic Orchestra; Christopher Lyndon-Gee. Original 2004 Marco Polo release.